With this compilation, you'll see that the track listing is evenly distributed between all the band's albums. 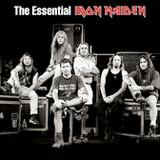 I think most fans would agree, the more "essential" Iron Maiden material is the older material. Personally, I would have nixed a few of the newer tracks from disc one in favor of some older classics like Murders In the Rue Morgue and The Prisoner, which sadly, are both absent here. However, also take note that there are no new tracks to speak of in this set either. Thus, it's very clear to me that this release isn't targeting die hard fans that own all Iron Maiden's albums. With the band currently on the OzzFest tour, many teens and 20 somethings from the younger generation of metalheads may be getting their first exposure to Iron Maiden. Or, at the very least, casual fans that aren't familiar with all the band's material might be getting a first in depth glimpse of the band this year. Having said that, this release is perfect for those type of fans. An unbiased, nearly equal amount of focus is placed on each segment of the band's career. You get to hear material for all three vocalists, and even get a taste of what the live albums sound like. This is a very efficient use of 2 cd's to give novice Maiden fans a comprehensive view of the band. From this two cd set, listeners will be able to choose the era of the band that they like the most, and begin building their collection from there. For what it is, this release hits the nail on the head. Die hard fans like me can argue that some tracks should be present in place of others, but that's not the point of this release. Still going strong after 25 years, this is a perfectly timed release to get some younger fans away from the garbage nu metal bands that creep their way into OzzFest, and more acquainted with a true metal giant such as Iron Maiden. For any of you who are just getting your first taste of Iron Maiden, or only have limited exposure to the band, this 2 cd set is a great way to familiarize yourself with this band's spectacular 25 year career. From this disc, you will be able to figure out which era of the band to build your collection around.